Abraham Cruzvillegas, Autoreconstrucción: To Insist, to Insist, to Insist, 2017/2018. Performance view, The Kitchen, New York, 2018. Barbara Foulkes. Photo: Paula Court. ART GALLERIES have traditionally preserved the paradox between the everyday theater of art, and the spectacle of exhibition display, while artists have simultaneously bucked these artificial divisions, and challenged the systems that reify, and rarify, their work. Mexican artist Abraham Cruzvillegas’s series of autoreconstrucción sculptures have formally investigated these tenuous distinctions through a material vernacular inspired by the low-income favelas, barrios, and shantytowns of Latin America. His assemblages are similarly constructed, utilizing found domestic materials to inhabit, and ultimately reclaim, privileged spaces. For three days on The Kitchen’s main stage, Cruzvillegas, in collaboration with choreographer Bárbara Foulkes and musician Andrés García Nestitla, performed Autoreconstrucción: To Insist, to Insist, to Insist, which was first presented in Mexico City last year. Cruzvillegas’s piece featured a large sculpture suspended from the ceiling built of materials scavenged from the streets of Chelsea, including a ladder, window shades, a washing machine, soccer balls, bed sheets, a shopping cart, and a bicycle wheel—a single mass to be activated, agitated, and ultimately destroyed by Foulkes. 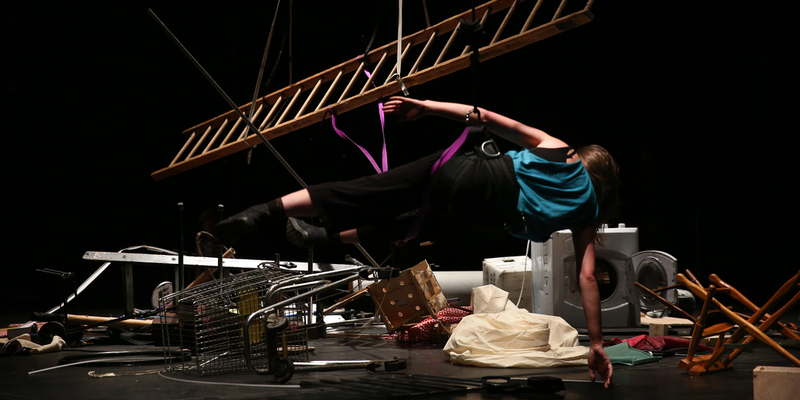 At times, she swung from the ceiling too; at other times, she was fettered to the precarious, behemoth art work. Nestitla’s live score, which fluctuated between percussive abstraction, traditional pre-Hispanic song, and strummed guitar animated both object and performer, as did the sounds of Foulkes’s footsteps, and the crashing of falling detritus. Foulkes and the sculpture appeared as though in a mutually-dictated dialogue, wherein she wound its cords to spin the mass, thereby prompting the object’s demise. While hanging beside it, she mirrored its centrifugal force, fighting it, using her own body to create jolting impacts, or yanking it via a nylon tether. 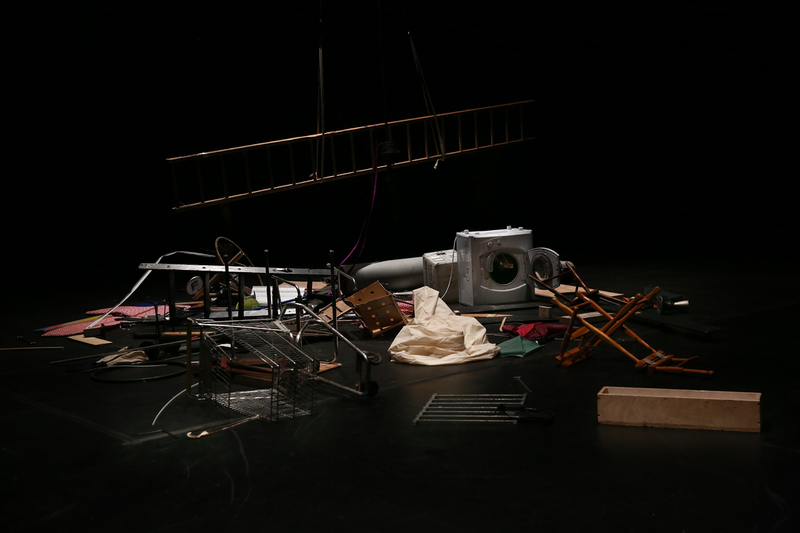 While her movements in each of the seven performances were improvised (and made in consideration of the audience’s safety), the inevitable result was the total destruction of the sculpture, and the exhaustion of performer. Abraham Cruzvillegas, Autoreconstrucción: To Insist, to Insist, to Insist, 2017/2018. Performance view, The Kitchen, New York, 2018. Photo: Paula Court. Entropy is central to Cruzvillegas’s autoreconstrucciones, and is what gives the piece its political dimension. Instead of simply demonstrating the sublimity of the laws of physics, the work is an allegory of collapse and reconstruction—the sculpture is rebuilt after every performance—and speaks to the survival strategies of low-income communities throughout the world, as well as the systematic construction and destruction of economically marginalized and oppressed communities by larger political bodies. Cruzvillegas’s work evinces both the Duchampian logic of the readymade, and the ongoing processes of sculpture. It also echoes the spirit of protest running through Gustav Metzger’s "Auto-Destructive Art,” Jean Tinguely’s “dematerialzation” machines, which comment on the potential of self-destruction as resistance, as well as Raphael Montañez O.’s 1962 manifesto “Destructivism” that celebrated the necessity of the “transcendental rituals” to sustain life. While Cruzvillegas’s autoreconstruccións are presented and commodified as art objects, the performance also lightheartedly suggests the artist’s desire to free himself and his work from the art market forces that bind him. John Arthur Peetz is a writer based in New York. Abraham Cruzvillegas presented Autoreconstrucción: To Insist, to Insist, to Insist from April 5th to April 7th at The Kitchen in New York City.